Talking “turkey” would have meant precisely that in the 1930’s, an era when wildlife biologists managed lands for individual species. But state, federal and private (NGO) wildlife managers say the parlance and philosophy of wildlife management has long-since changed. Talking turkey today, or ducks or deer or pheasant, often means providing habitat for non-game birds and butterflies too. The quandary for wildlife managers is how to pay for it. Most of the money available for habitat comes from hunters. So, modern-day wildlife management increasingly involves joint ventures between hunting and non-hunting wildlife conservation organizations. Michigan Audubon’s Phyllis Haehnle Memorial Sanctuary in Jackson County is one place where that partnership worked well. Ducks Unlimited contributed almost $13,000 towards a 40.5 acre land acquisition there in 2007. That money combined with $189,000 from Michigan Audubon for the purchase, helped leverage a $1 million federal North American Wetland Conservation Act grant. Those federal funds paid for 20 conservation projects including a 20-acre native prairie restoration at Audubon’s Otis Farm Bird Sanctuary in Barry County. conservation group put up $41,000 for a $106,000 water control structure project at the Bernard W. Baker Sanctuary in Calhoun County. 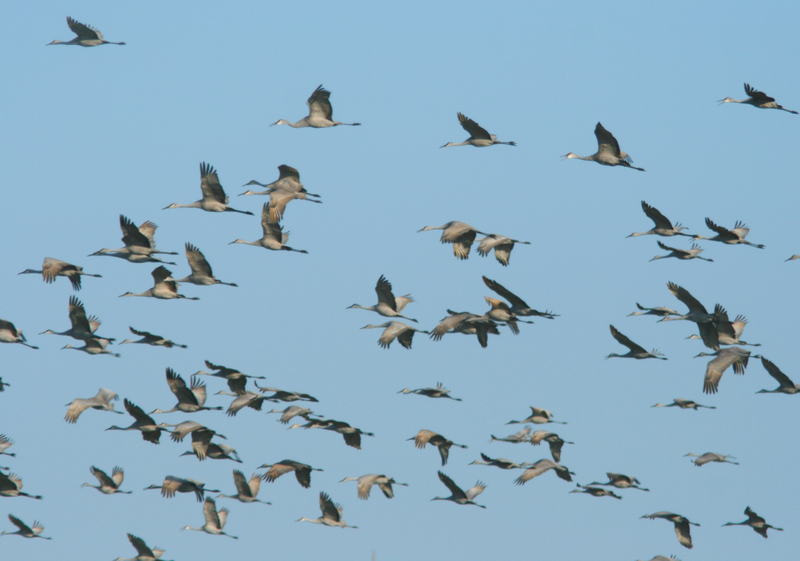 The site is well known for its Sandhill Cranes and Audubon’s signature Cranefest each fall. The balance was covered by other project partners including MAS, the Kiwanis Club of Battle Creek, the Calhoun Conservation District, Michigan DNR and US Fish and Wildlife Service. DU then administered the $39,000 NAWCA grant that was secured. 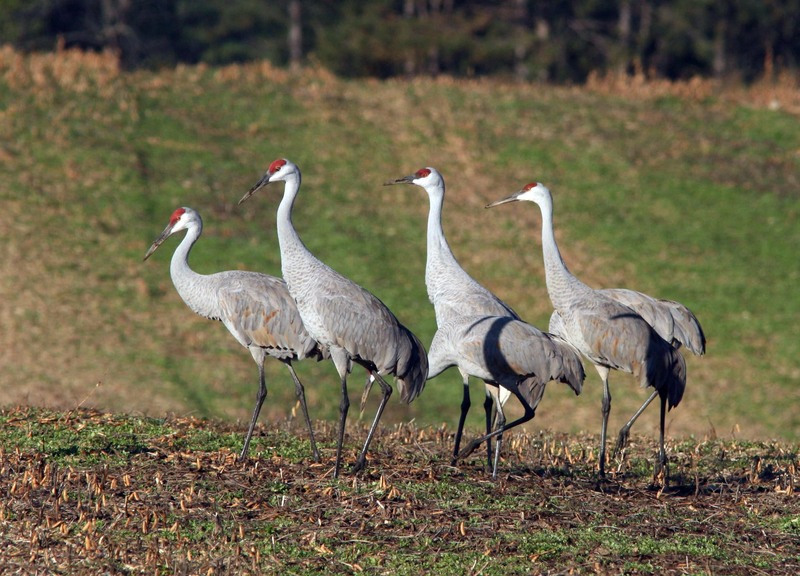 Its involvement ultimately improved habitat at the sanctuary for Sandhill Cranes. “There is a misconception out there that all of our projects are so people can shoot ducks,” said Michael Sertle, a Ducks Unlimited regional biologist out of Ann Arbor. “We are a wetland conservation organization first and foremost. Heather Keough, the acting forest wildlife biologist for the Huron-Manistee National Forest, said multiple-species management is always the preferred approach in the national forest. Keough said. The grassland restoration project there is funded by the U.S. Forest Service with matching money from the National Wild Turkey Federation, Michigan Wild Turkey Hunters Association and Ruffed Grouse Society. Among its beneficiaries are Eastern Bluebirds, Red-headed Woodpeckers, Barred Owls Bald Eagles and a variety of hawks. “It’s also an awesome turkey and grouse spot,” Keough said. That’s how it works, says Mark Sargent, a private land program manager for the Michigan Department of Natural Resources. His agency received an $860,000 competitive grant this year from the US Fish and Wildlife Service for grassland restoration and planting on 1,700 acres in southern Michigan. One quarter of the land is public; the rest will be on private lands. The financial partners who put up $380,000 in matching funds include: Pheasants Forever, Ducks Unlimited, The National Wild Turkey Federation, The Nature Conservancy and Michigan Natural Features Inventory. “The (federal) money is available only for priority non-game species. This is going to be a win win win situation,” Sargent said. “It will help Grasshopper Sparrows a state species of special concern, Henslow’s Sparrows a state endangered bird, Karner Blue Butterflies a federal endangered species, and Northern Harriers a state species of special concern. Overlapping interests are now common ground for wildlife managers, according to Randy Showalter, a National Wild Turkey Federation biologist for Indiana, Michigan and Ohio. “We talk less about game species and more about habitat,” Showalter said. “Some of the work we do these days is beneficial to bats too, which need to have openings. “One of our biggest projects is in the Huron-Manistee National Forest. We will be working to create savannah conditions and opening in forests. We are giving money to the forest service that they will use for the project. 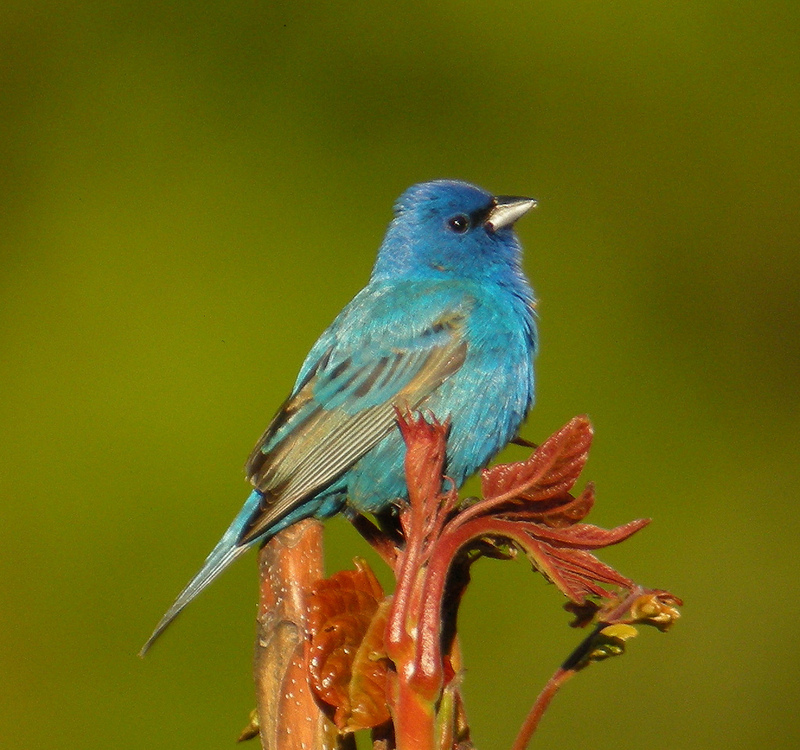 Indigo Buntings benefit from forest management that is often associated with hunted species like deer and grouse. Photo by: Kevin Bolton, Wikimedia Commons. Al Stewart, the upland game bird specialist for the Michigan Department of Natural Resources, says one thing the public often doesn’t realize is that hunters are helping game and non-game species. Most habitat management is paid for with funds money from the state Game and Fish Fund and the federal Pittman-Robertson program. The former is made up of hunting license fees. The latter is money from federal excise taxes hunters pay for ammunition, firearms, bows and arrows and other hunting gear. Those funds are returned to states annually in amounts that vary depending on the number of licensed hunters. In Michigan that money helps, among other things, a program called the Woodcock Initiative which addresses the decline in American Woodcock populations. But the work on the ground also benefits a variety of bird species that may need help. “One of the key species it helps is the Golden-winged Warbler,” Stewart said. The warbler was listed as declining in the 2011 Michigan Breeding Bird Atlas. 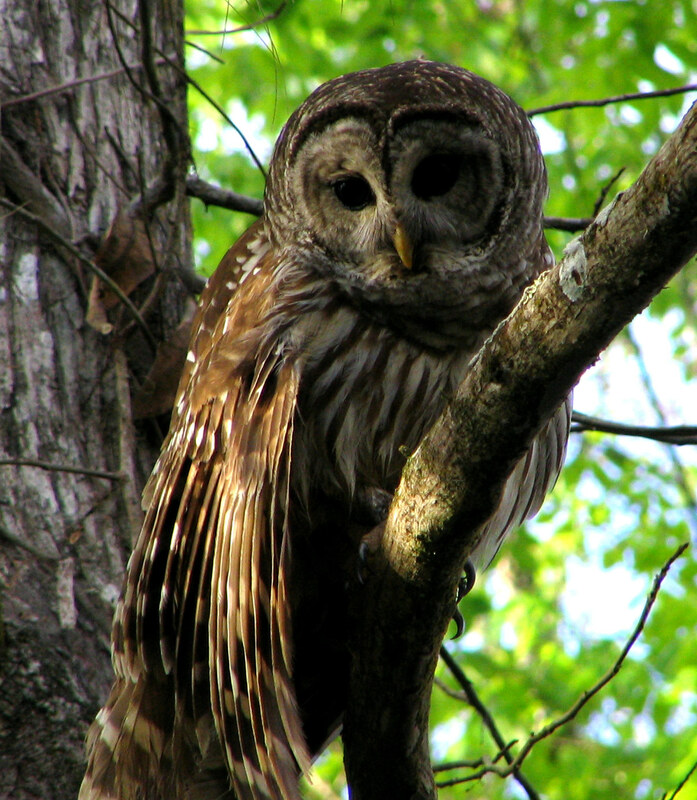 “They use the same habitat as woodcock,” Stewart said. “They like aspen, alders and brushier habitat than old forest. They like areas with shrub lands and some grassy areas. This story was written for Michigan Audubon Society and appears in its September/October issue of the Jackpine Warbler. This entry was posted in Uncategorized and tagged Birds, Conservation, DNR, Ducks Unlimited, Environment, Grasslands, Hunting, Huron-Manistee National Forest, Michigan Audubon Society, National Forests, National Wild Turkey Federation, Nature, U.S. Fish & Wildlife Service, Wetlands, Wildlife. Bookmark the permalink.